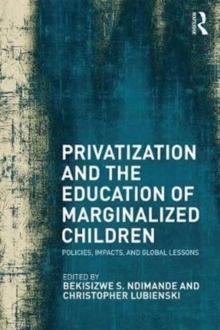 Privatization and the Education of Marginalized Children examines the issue of markets in education as they shape educational opportunities for disadvantaged children-for better or worse-in countries around the globe. With chapters written by leading scholars in the field of international education, this book analyzes the important questions of equity and markets, privatization and opportunity, and policies' objectives and outcomes, and it explores the potential, promises, and empirical evidence on the role of market mechanisms. Offering insights from theoretical as well as international-comparative perspectives, this volume will appeal to researchers and students of education-focused public policy, sociology, and international economics. A timely contribution to the field, Privatization and the Education of Marginalized Children aims to engage in public/private debate by addressing the larger societal exclusions and segregation of communities in which these schools exist.